Chinese recipes have come all the way from China and created its own distinct flavor, here in India. 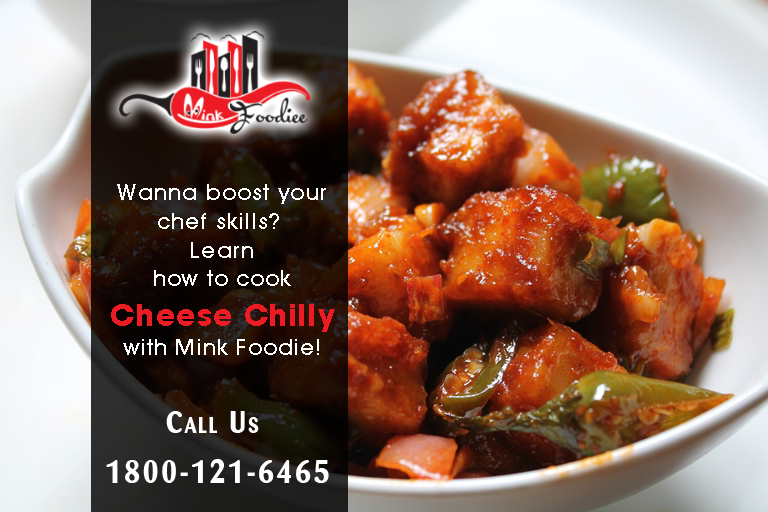 Cheese Chilly is a tasty and nutritious recipe; it’s an Indian form of a Chinese recipe. You can have it as a starter or as a side dish with your meal. Cheese Chilly an also be eaten along with chowmein or fried rice. You will like it in any way. Cut cottage cheese into square cubes, take 1/2 tablespoon of corn flour in a plate and wrap the Cheese cubes in it. Pour 2 tbsp of oil in a non stick pan and spread evenly all over. After oil is heated, put the cheese cubes in it to cook and fry (as you turn them over constantly) till both sides turn light brown. Take out the fried cheese. Now pour the remaining oil in the pan, after it heats, put ginger and green chilies for frying. Add green capsicum and fry for a minute. Put red chopped capsicums and fry for another minute. Now add fried cottage cheese cubes, tomato sauce, soya sauce, chili sauce, vinegar, chili flakes, black pepper, ajinomoto and salt. Mix all the ingredients on a low flame till they are all mixed thoroughly. Dissolve the remaining corn flour in 1/4 cup water till all lumps disappear and mix it in the cheese chilly. Cook it for a minute as you stir regularly. Add mint leaves to garnish. 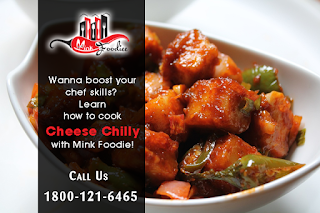 Delicious, piping hot Cheese Chilly is ready, prepare noodles and serve along with it.